I didn't know this even existed till today, when my delightful friend Katie pointed me toward Spoonflower, a site where you can design and order your own fabric. No minimum purchase, which is great, $16.20/yard, which is...I don't know. It's been a long time since I bought fabric. 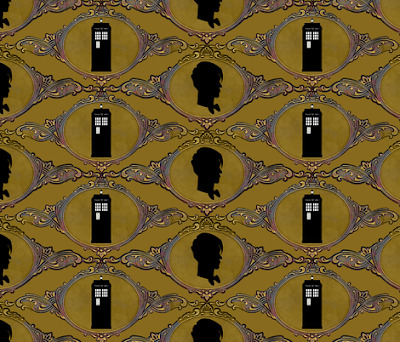 Anyway, because you can design your own, there are a number of Doctor Who-themed fabrics—I gather there are a lot of crafty Doctor Who fans out there. These were my two favorites, not just Who-y but actually rather elegant: Dr. Who Makes a Cameo and TARDIS Travels Damask. Quite cool. And now I kind of want to go design a fabric myself.